Each year we offer five week-long diving tours with set departure dates between late June and the end of September. This cabin charter is designed to appeal to individuals and couples who wish to include diving in their Turkish coast cruising itinerary. The week proceeds much as a normal cabin charter cruise would, with a balanced variety of activities for both divers and non- divers. 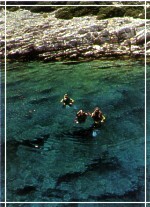 Those who are not diving have the opportunity to explore the shores, snorkel, swim, fish and soak up the sun. The vessels from which we conduct our diving tours are equipped for maximum safety and offer fully crewed service for groups of up to twelve, provided that of the twelve at least five are active divers. Accommodation is in double cabins with ensuite showers and WCs. Individuals can opt to share their cabin if they wish, and will thereby avoid the single supplement. Active divers need to add the cost of the diving supplement to cover a dive guide, filled scuba tanks, regulators and weight belts. All other equipment can be brought along by yourself or hired at an additional cost.